I was able to bring Reggae to the Cali with The Trojan Road Show for whom I was the mc for 4 years. The Pama Record Company PA nites. Great audiences at the Cali, well behaved (well weren't we all then.) The Bouncers local lads were absolute gents. The Cali prior to the Ilka's taking over was being allowed to run down through restrictions placed on Mrs. Green by her late husbands estate. Many of the bands were gob smacked by the lack of facilities back stage, worn out carpets, springs sticking out of the settee's a grim place. Front of house the fans were great. Memories of the groups Marv Johnson, Edwin Starr, Jimmy Ruffin, Sam & Dave Martha Reeves were just a few of the early soul acts. I left just after John took over, as I wanted to use my own equipment rather than stand behind that huge control panel by the Hillside Bar. 2004 sees my 40th anniversary in the business, it's taken me all over the world appearing with many of the major acts of yesterday and today, encouraging new talent, training DJ's with techniques and stylisation; club design and radio station work around the globe. It's amazing how many old Cali ravers I meet up around the world, as each show I do to this day has a 45min' slot dedicated to the California Ballroom. It's amazing who walks out of the darkness and says hello. Sad to read of the loss of Micky Ilka and Bruce Benson I was fond of them both. Lights: None worked. Mostly in the dark except for the light from the bar. Microphones: 4 (akg 2000e condenser mikes) placed around the stage area. Decks: Twin Goldring Lencos mounted on self standing consol. Mixer: WEM Studiomaster, Wem copycat echo machine. Studio Sound Jingle Machine. 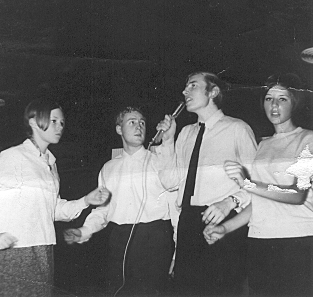 Carl on stage with 3 unknown assistants.